Posted: Wed Jun 04, 2014 8:14 pm Post subject: a passage in Maspero? There Maspero mentions Pharaoh Teti, the founder of the VIth dynasty. Further, Maspero talks about a certain monument of the early part of the XIXth dynasty, a ″pyramid that was opened up in 1881″, where Teti was mentioned. "He [Teti] is called Teti Menephtah, with the cartouche prænomen of Seti I., on a monument of the early part of the XIXth dynasty, in the Museum at Marseilles: we see him in his pyramid represented as standing. This pyramid was opened in 1881, and its chambers are covered with long funerary inscriptions. It is a work of the time of Seti I., and not a contemporary production of the time of Menkaûhorû." So my question is, What was that pyramid that was opened in 1881? Does anybody know? I must admit that I'm somewhat confused by this whole passage, so perhaps someone could clarify it for me. I did some searches on the Net, but am still not much wiser about the whole thing. Was it a pyramid of Seti I, or II? Or of someone associated with them? Posted: Wed Jun 04, 2014 10:32 pm Post subject: Re: a passage in Maspero? ... reading some old books about Egyptology ... 'History of Egypt' by Maspero ... There Maspero mentions Pharaoh Teti, the founder of the VIth dynasty. Further, Maspero talks about a certain monument of the early part of the XIXth dynasty, a ″pyramid that was opened up in 1881″, where Teti was mentioned. It is the only known pyramid for him, the one in Saqqara, opened and 1st published (pyramidtexts) by Gaston Maspero in 1881. Cairo, Egyptian Museum, CG 34188 is a stela (1,25 x 0,75 m, limestone, painted) of Mer(y)ptah and his son Dhutmosi from the 19th Dynasty, with the cartouches of Teti (Barsanti, ASAE 13, 1914, pp. 255 - 256), found in the Mortuary Temple of Teti I pyramid complex. The king was obviously, at least locally, still worshiped in the New Kingdom. Clearly no. There is only a name similarity between the Meryptah (Beloved of Ptah) mentioned on the stela, and some name forms / additives of some kings of the 19th Dynasty. We must not forget at this point, that Egyptology as science just arised... Of which object in Marseilles Maspero is talking about, I can not say. However, this writing of the name for king Teti I. from the 6th Dynasty is, as far as I know, not assigned prior the 19th Dynasty. Maspero presumed as a possible reason the importance of the god Ptah in Memphis / Saqqara or a special reminiscence of the donor of the stela to "his" kings from the 19th Dynasty, some of which, as I said, also led these additional in there name (Gaston Maspero : Catalogue du Musée égyptien de Marseille. - 1889. - pp. 10 - 11). The guy depicted, the Scribe of the Offering Table of the Lord of the Two Lands Amenwahsu is also depicted somewhere else, isn't he? Amer, A.M.A. : The Scholar-Scribe Amenwahsu and his Family. - In: ZÄS 127. - 2000. - pp. 1-5. Collins, Lydia : The Private Tombs of Thebes - Excavations by Sir Robert Mond, 1905-1906. - In: JEA 62. - 1976. - pp. 18-40, esp. p. 33. 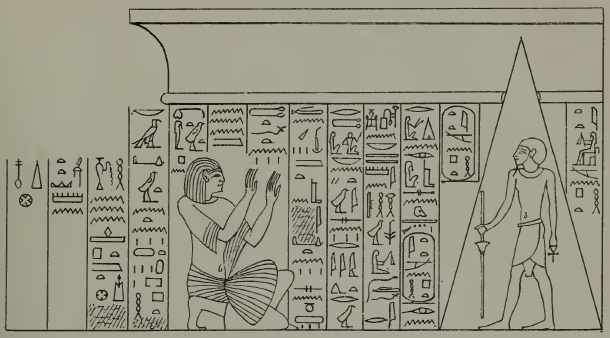 Porter, Bertha and Rosalind Moss : Topographical Bibliography of Ancient Egyptian Hieroglyphic Text, Reliefs, and Paintings - I, 1.: The Theban Necropolis - Private Tombs. - Oxford : Clarendon Press, 1960. - p. 229. Habachi, Labib : Amenwahsu Attached to the Cult of Anubis, Lord of the Dawning Land. - In: MDAIK 14. - 1956. - pp. 52 - 62, 2 Abb., 2 Taf. Barthelmeß, Petra : Der Dialog des Amenwachsu mit den Wächtern des Osiris. - In: FS Gundlach zum 65. Geburtstag - ÄAT 35. - Wiesbaden : Harrassowitz, 1996. - pp. 18 - 22. So this was the pyramid of Teti that Maspero opened up. And there was a chapel there, as part of the pyramid complex, that was probably remodelled or added during D19. And in this chapel, there were a couple of stelae dedicated for a D19 character Mer(y)ptah -- probably by his son Dhutmosi. They were portrayed adoring Teti as 'Teti Menephtah'. According to Barsanti, the stelae show that Teti was adored as divinity even in D19. His funeral chapel served as a temple where people came to adore him as god. It's pretty amazing that the worship of Teti went on for so long. BTW is the name 'Mer(y)ptah' the same as 'Menephtah'? How are these two names related? Where's he depicted? Is he the kneeling man on the stela? I wonder if Teti was actually worshipped as the guardian deity of the necropolis of Saqqara due the location of his complex (just by the necropolis road of access, and very close to the New Kingdom tombs). TT111 Amenwahsu apparently was a man connected to the Theban cult of Amun. I wonder if his influence went to far, or Saqqara's Amenwahsu was a different person. There is an stela depicting another Amenwahsu alongside with the pharaoh's son-in-law Tia. Hibachi (1969) believes that this Amenwahsu was Tia's father, what makes him a different person from TT111 Amenwahsu. Tia is not mentioned in the tomb (unlike Amenwahsu's other sons Ipu, Dedia and Khaemopet). Thus, is possible that the Amenwahsu fron Teti's stela is not the scholar scribe Amenwahsu, but rather someone else buried in Saqqara's New Kingdom sector. Appears to me personally, also with view of the unclear origin of the relief, as too speculative. It is not even clear if this relief (Chicago OI 10507) is part of a stela and if it comes from a tomb or a temple. Also the place where it is from is not really secure (Saqqara?, Abydos?). "Habachi, L. in Rev. d’ Ég. 21 (1969), 45-6  pl. 3 (as temple relief); Martin, Corpus i, No. 74 pl. 27; id. The Tomb of Tia and Tia (1997), 47-8  pl. 98 and van Dijk, J. in ib. 49-50 (as possibly from Abydos) = van Dijk, J. The New Kingdom Necropolis of Memphis. Historical and Iconographical Studies (1993), 85-8 (as possibly from Abydos) fig. 14 (from Martin); Pridmore, J. in AramcoWorld 4  (Nov.-Dec. 1993), fig. on 18 [lower]; Berlandini Keller, J. in Les Dossiers d’Archéologie 241 (March 1999), 64 fig. on 65 [upper]; Teeter, E. in Near Eastern Archaeology 62 (1999) fig. on 98 [lower]; id. in Egyptian Archaeology 16 (2000), fig. on 42 [lower]; id. Ancient Egypt. Treasures from the Collection of the Oriental Institute, University of Chicago (2003), 56-7 , 128 , 134  figs. on 8-9, 56 (as probably from Abydos). Sethos I and son, id. in KMT 10  (1999), fig. on 51 [upper right]. Text, kitchen, Ram. Inscr. i, 320  (as relief)." Also I think that if this Amenwahsu was Tia's father it should be mentioned in the text?